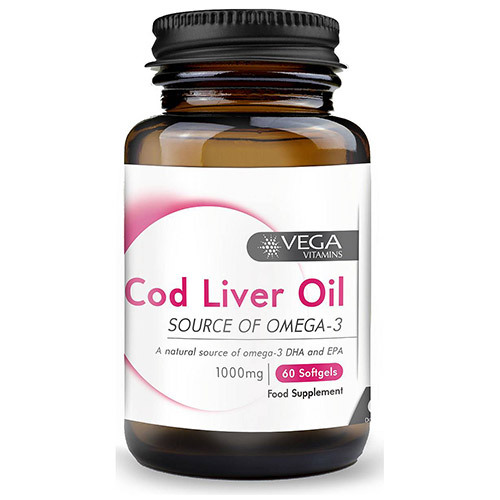 Vega Vitamins Cod Liver Oil is a natural source of omega-3 essential fatty acids (DHA and EPA) and contains 100% NRV of vitamins A and D. May help to support the heart, brain and vision. Cod liver oil has a high ratio of DHA to EPA. DHA forms about 8% of the brain by weight and supports brain and nervous functions, whereas EPA supports brain and cardiac functions. Cod Liver Oil (Fish), Softgel Shell (Bovine Gelatin, Glycerol), Antioxidants (D-Alpha Tocopherol, DL-Alpha Tocopherol), Vitamin A (Retinyl Acetate), Medium Chain Triglycerides, Vitamin D3 (Cholecalciferol). As a food supplement for adults take up to 3 softgels daily with food or as directed by a healthcare professional. If you are pregnant, consult your doctor before use as this product contains Vitamin A. Below are reviews of Vega Vitamins Cod Liver Oil - 60 x 1000mg Softgels by bodykind customers. If you have tried this product we'd love to hear what you think so please leave a review. Great product, no after taste, my husband says it makes a definite improvement to joint movement and notices the difference if he runs out of them!